I may have captured an orb image – pretty neat, a bit scary, and definitely confusing. Last night’s featured speaker at my writing chapter—Maryland Romance Writers—was Mark Nesbitt of Ghosts of Gettysburg. Near the end of his presentation of paranormal phenomena, he showed an image of a paranormal orb. It sparked recognition, because I’d just seen one of those on a New Jersey conference photo I’d taken. My husband had waved it off as a water spot, but none of the other 25 pictures taken at the time had blemishes. I had the laptop, so opened my photos and found the picture, which I showed to Mark. He considered it and told me what I presume are the standard caveats—it’s dust, or an odd reflection from the flash. But it was one of the largest and most perfectly round images he’d seen. 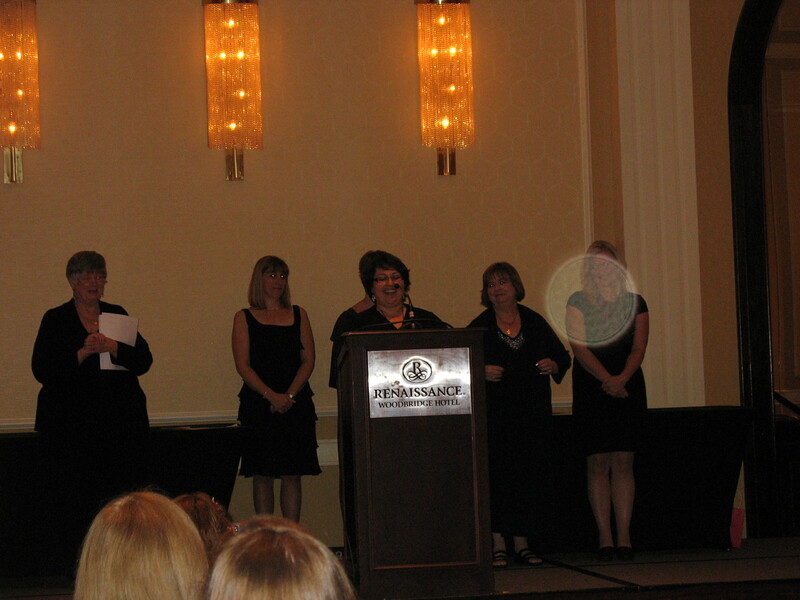 I surveyed the other writers in the chapter who had also attended the event and found another photo of our chapter mate at the podium. Virtually the same image—though different angle—but no orb. I showed both to Mark in disappointment, but he still came back with a little ray of hope: Video is shot at three frames per second and orbs often flash in and out frame by frame. I don’t know what to think, other than this is great writing fodder! Here’s the picture so you can judge for yourself. By the way, that’s Stephanie Dray, accepting the Golden Leaf Award for her winning historic novel Song of the Nile. She also writes paranormal, so there could be a connection. For more information on Mark Nesbitt and his ghost hunting books and tours, go to Ghosts of Gettysburg.